Two-dimensional periodic waves in a shallow water wave tank. Taken from Joe Hammack, Daryl McCallister, Norman Scheffner and Harvey Segur, “Two-dimensional periodic waves in shallow water. Part 2. Asymmetric waves”, J. Fluid Mech. (1995), Vol. 285, pp. 95-122 Hammack et al. (1995) . 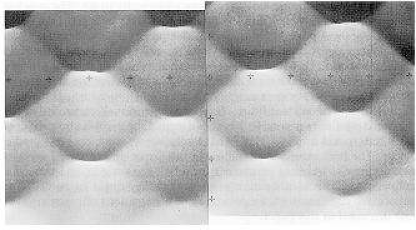 The caption reads “Mosaic of two overhead photographs, showing surface patterns of waves in shallow water”.